It's another one of those really slow weeks.... I keep thinking it's Friday and scheduling my work wrong. I can't wait for this week to be over already! Today's polish is from a new order that I received from Digital Nails. I've realized that I've become addicted to this line because I love the playful nerdiness and beautiful innovative glitter combinations of the polish. 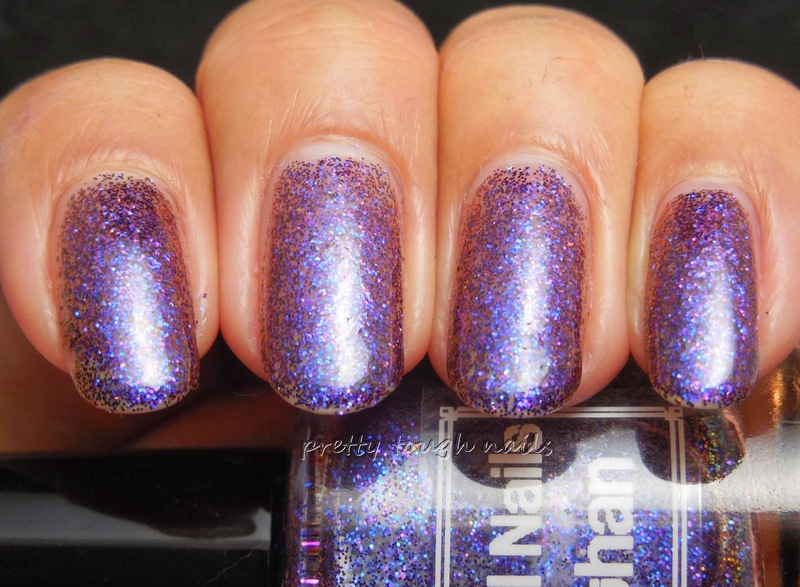 Leviathan is an incredible microglitter that color shifts from blue, purple, and pink and orange in a clear base. I chose to use four coats here, but I can see it being layered over a purple or blue base if you prefer more of a solid colored application. The formula was on the sticky side, but that happens to work for this polish because it allows for easier and precise application of the microglitters, especially towards the cuticles. I finished this with a layer of topcoat for added shine. Can you see the color shift and holographic glitters? It's such a dynamic sparkling polish, shifting and changing colors when hit by different angles of light. Unfortunately it wasn't easy to capture on camera - it's definitely one of those polishes that you need to see IRL to appreciate. I'm very satisfied with my order from Digital Nails, and I look forward to swatching the rest of my treats. If you haven't checked out her Etsy store, give it a browse. I'm sure you'll find something you'll like! This is a super pretty glitter! I'm sure it would look great layered over a base too. I've been wanting to order from Digital Nails for quite some time. Her color I'm Sorry I'm Not Made Of Sugar has been on the top of my list for a while.